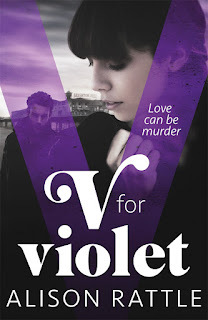 V for Violet is set in London in the early Sixties. The atmosphere and social norm of the times is vividly captured. The youth, their habits and longings, their search for pleasure and identity, and the taboos of the era are superbly depicted. Violet is sixteen years old. She works daily in her dad’s Fish and Chip shop and sees only futility her life; without hope of change or escape. The library where she spends a lot of time reading has made her an intelligent girl. This is supported by the smart dialogue she is allocated and her excellent thought process. After seventeen years, Violet’s mother is still mourning the loss of her hero son Joseph, believed to have been killed in the war. But nothing could be further from the truth. Beau walks into the shop and Violet’s world tilts. A leather jacket and a motorbike add to his attraction. He shows an interest in her and her overcast world is bathed in light. Joseph returns with dark secrets and astonishing burdens he can’t share, at the same time that a string of teenage girls are murdered. When her best friend Jackie is added to the list, suspicion falls on the most obvious person. A complex web of mystery is built around these murders and the pages turned as I tried to identify the murderer, but couldn’t. That’s how riveting is the plot. This story calls attention to how often we see things one way then they turn out to be something entirely different. Powerful writing and a brilliant turn of phrase, there’s no stopping for a break in this novel. Find a comfy chair and settle down to read. Full of mystery and suspense, red herrings and an explosive ending, this is a brilliant mystery thriller.